Wendy has a new flat. The flat doesn’t have a washing machine. She has dirty clothes. She looks for washing machines on the Internet. There are many washing machines. It is very difficult to choose from so many washing machines. She reads a text in a blog. It says it is much better to wash clothes in a laundry. A laundry is a shop where many people wash clothes. The text says that a washing machine at home is for people who need to wash a lot. It is not for people who live alone and wash only once or twice a week. It is cheaper not to have a washing machine. She takes a calculator(计算器). She counts. She is alone. She washes only once a week. She looks for a laundry near her flat. She is lucky. There is a laundry not far from her flat. It is not expensive to wash there. She is not going to buy a washing machine, at least not for now. She doesn’t need a washing machine. 1. Why does Wendy want a washing machine? A Because she has a new flat. B Because the flat has a washing machine. C Because she has dirty clothes. D Because she is lazy. 2. 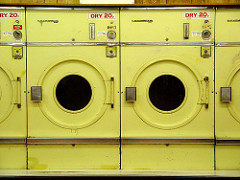 It is not ______ to choose from washing machines on the Internet. 3. How often does Wendy wash clothes every week? C Three times a week. D Four times a week. 4. Which statement is NOT true according to the passage? A It is expensive not to have a washing machine. B There is a laundry not far from Wendy’s flat. D Wendy washes only once a week. 5. The passage is about ______.